Miner’s Colfax Medical Center is dedicated to providing the best healthcare possible to the residents of Raton and Northeastern New Mexico. 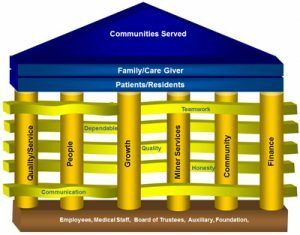 In the spirit of this lofty goal, we are constantly working to improve the services we provide and this strategic plan will help ensure that MCMC will be available in both the short and long term to continue providing the quality of care our patients deserve each day. Miners’ Colfax Medical Center, partnering with other healthcare providers who share our values, will be a leader in providing healthcare services. The Medical Center shall continue to serve the miner beneficiaries and the public. Quality, Teamwork, Dignity, Respect, Compassion, Efficient, Reliable, Accountable, Trustworthy, Public Education. By the end of FY2018, establish a regional behavioral health program with community partners to provide comprehensive behavioral health services, including chemical dependency, across the continuum of care. Further develop and expand health care career pathways and mentoring program beginning at middle school level to include potential careers in all health care fields by the end of FY 2015. Be a center of exceptional customer service as measured by the NRC Picker Survey with rating at or above the 60th percentile in recommending MCMC and overall satisfaction by the end of FY2015. Strengthen the financial position of MCMC by improving the efficiency of the billing system, with a positive cash flow by the end of FY2015 and a 2% operating margin by the end of FY2016. Educate the legislature and government agencies regarding our initiatives and seek their support for providing resources (ongoing). By the end of FY2015, create a world renown and recognized pulmonary facility attracting patients from throughout the United States with 80 patient visits per month for the Pulmonary Rehabilitation Program. By the end of FY2015, design a recruitment and retention program to maintain a core group of health care professionals with the Raton Basin, reducing the turnover rate to 10% and reducing the agency contract cost by 50%. Create a comprehensive training program for all employees, including managers, that will develop exceptional quality skills for implementation by the end of FY2015. Develop a comprehensive primary and specialty care program based on evidence based medicine and efficient management practices designed to meet our customers’ health and wellness needs.